We apologize, but the 2017 Lineage is currently sold out. We won’t have any more until June of 2019, so Club Members be on the lookout for more information on our release date next Spring! 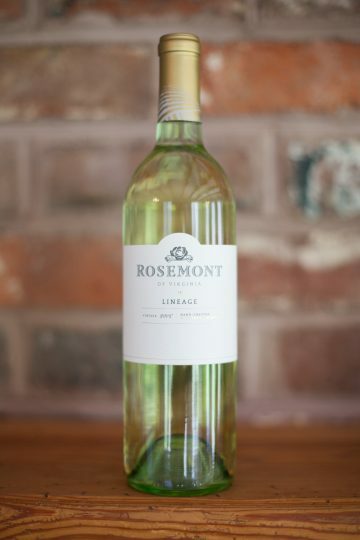 Lineage is a special white wine, a small batch of only 142 cases, crafted especially for Rosemont Club Members. It is made from 100% barrel fermented and aged Chardonel. Our 2017 vintage has aromas of white peach, marmalade, and apple, with undertones of coconut and vanilla bean. It is fuller bodied white with a smooth creamy palate that finishes with a fresh green apple acidity. We enjoy this wine when it’s served a bit warmer than your average white wine – so take it out of the refrigerator about 30 minutes prior to drinking to optimize the beautiful aromas and flavors.